The defense ministers of South Korea and the United Arab Emirates have held talks to discuss ways to strengthen military ties and defense industry cooperation, Seoul's defense ministry said Sunday. During the talks in Abu Dhabi on Saturday, Defense Minister Jeong Kyeong-doo and his counterpart Mohammed Ahmed Al-Bowardi agreed to beef up military personnel exchanges and strengthen cooperation in such areas as military training and responses to cyber threats, the ministry added. The two sides also decided to promote defense industry cooperation between the two nations, it added. Jeong also called for the UAE's support for Seoul's efforts to pursue complete denuclearization of the Korean Peninsula and bring a permanent peace to the peninsula. 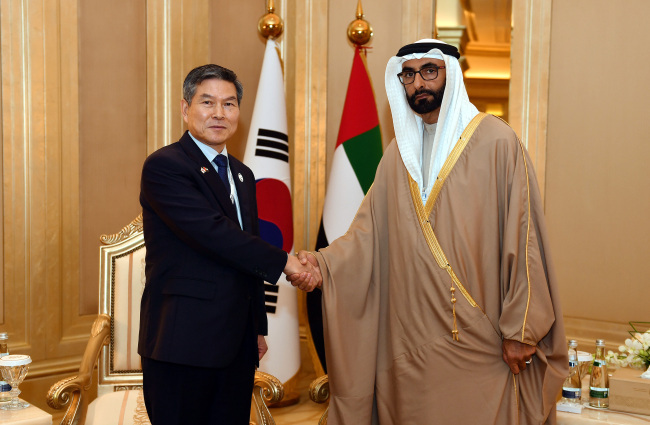 The UAE minister expressed support for complete denuclearization of the peninsula and the development of inter-Korean ties, the ministry noted.